This was the second time the NYC Pier Antique Show was conducted under the management of U.S. Antique Shows. Last November’s show was decent for us. This one was worse than last March, when we had a bad show. Ugh! I have a couple of possibilities of selling some important items after the show is over, but I never count my chickens until they’re hatched. Saturday was a rough day. Attendance was moderate, interest was fair, and sales were nowhere to be had. Strange. Last March was awful, followed by the November Pier show, which was significantly better. I never used to notice a substantial difference between the fall and the spring shows, but it seems to be coming clear. Regardless of the season, New Yorkers are tough. I guess they’re jaded, because so much is available. There are many shows, shops and auctions. Most of the time I’m happy to exhibit in other cities where the folks are more interested and appreciative of the efforts made to come to their city. Sunday wasn’t much better. There were fewer people, but slightly better interest. We ended up having a poor show that didn’t even cover our expenses. On the plus side, we bought a few items during setup from other dealers that should give us a decent profit when they’re sold. So if we look at the total picture, eventually it won’t be a losing show. I was an unhappy camper this time, so I didn’t ask too many people for their results. Here’s what I saw and heard. An art dealer did very poorly and left the show early. From a lamp dealer “Not very good.” Another lamp dealer told me he sold a lamp at the last minute, so he made a profit. A Midwest general dealer said he had a fine show and hoped to do as well in Chicago in a couple of weeks. 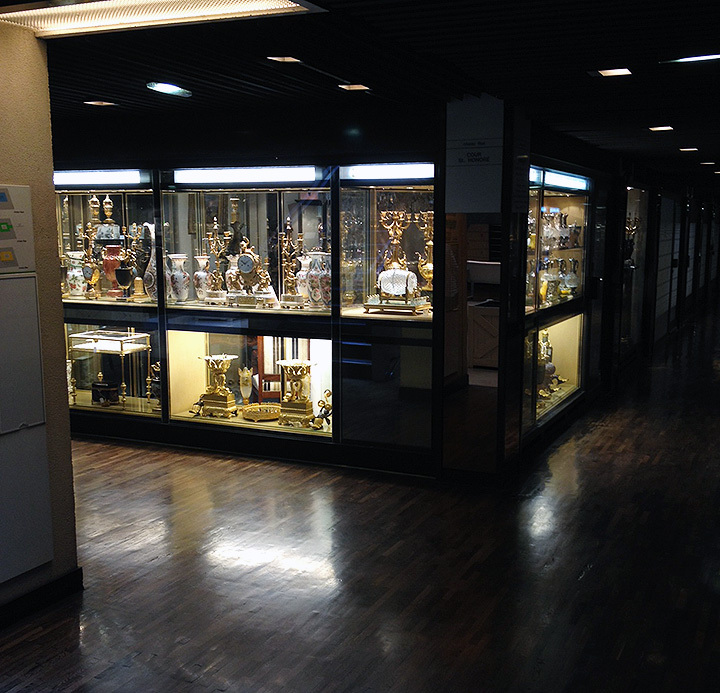 And finally, a California dealer in carnival glass and Hummels told me he made money. It was his first time at the show. Next up will be the Chicago Botanic Garden Show in Glencoe, IL, April 11-13. It will be our second time there. Last year we exhibited in one of the many tents erected for the show. It was really tough, with the weather and shaking lamps and showcases. This year we’ll be in one of the permanent buildings, in a large booth. It should be nice. We’ll have our new purchases from our European buying trip for sale at the show, as well as some great domestic purchases. Woody Auction held a sale, The late Dr. Ernest Rieger Collection, on March 20, 2014, with superb results. Bidding throughout the sale was fiercely competitive, with multiple bidders vying for the “fresh meat”. Dr. Rieger had put together a varied and high quality collection and it was put up at auction with no reserves, or estimates, on any item. They were going to sell for whatever the market would bear, and the great results bore out that modus operandi. I tried to buy many items, but was outbid on most everything. But I’m not complaining, as it means the market is healthy. The best prices were achieved by the high quality offerings of Tiffany Favrile glass, French cameo glass and English cameo glass. Top lot of the sale went to Tiffany, with lot #383, a magnificent, very rare, paperweight vase with several wheel-carved insects. It sold for $60,000. The top French cameo glass lot of the sale was a rare Daum Nancy Rain scenic table lamp, 13½” tall. It soared to $38,000. 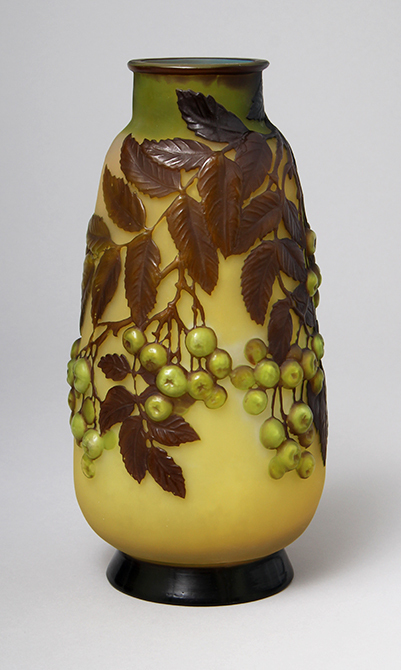 A beautifully carved English cameo vase by Webb was the top lot of the English glass offerings. It went out the door at $35,000. 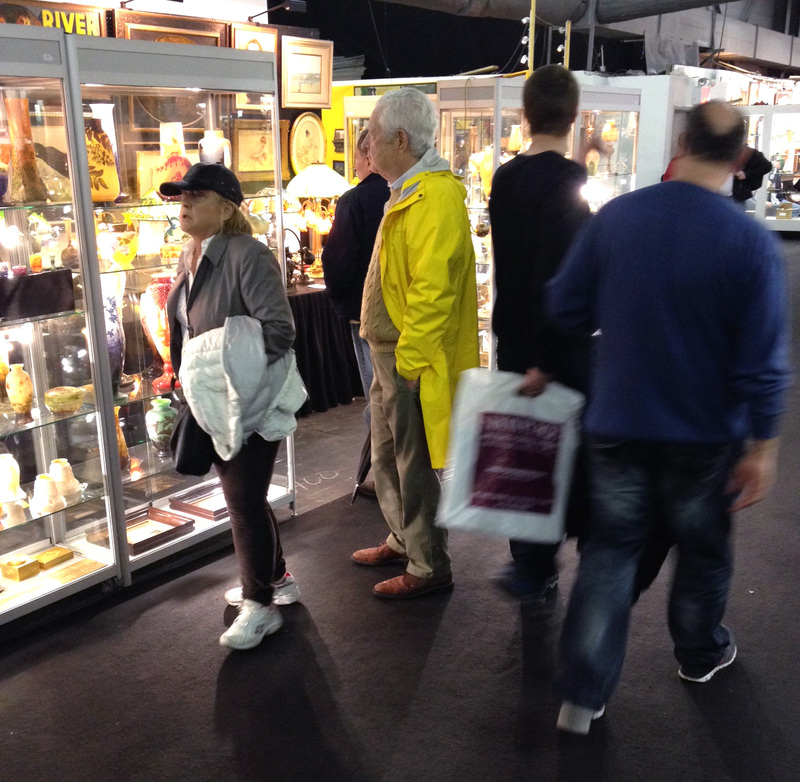 Remember, the NYC Pier Antique Show will be held this coming weekend, March 29-30, 2014. It’s always fun and exciting, so make your plans to come to the Big Apple. We’ll have our new purchases from our European buying trip for sale at the show. The NYC Pier Antique Show opens to the public this coming Saturday, March 29th, at 10 AM and continues until Sunday, March 30th, at 6 PM. The show is located at Pier 94, W.55th St. and the Hudson River. Since the show is only two days long, the action happens faster than at longer shows. It’s great for the dealers – two days and the results are in. The show is very diverse with items ranging from vintage clothing, jewelry, collectibles, silver and Asian, to the best French and American art glass and lamps (me!). 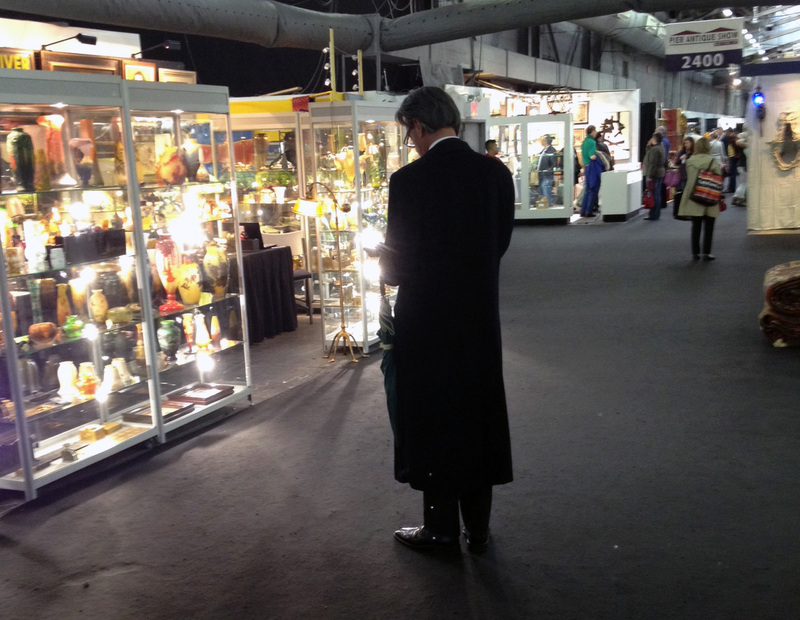 Buyers travel great distances to visit the show from as far away as Japan and Europe. We’ve also sold to Americans from all over the US. Not many shows are worth the trip from almost anywhere, but this one is. My booth is near the entrance, so you can’t miss me. Please stop in and introduce yourself. 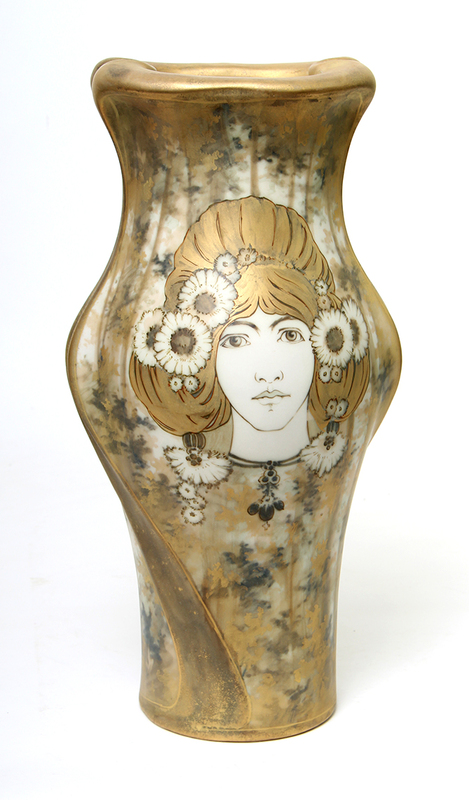 Gallé blownout vase — one of the great new items we’ll have at the show. I’m bringing the new items we bought on our European buying trip, as well our great selection of French cameo glass, Tiffany glass and lamps and much more. Make plans to visit the show and play in the Big Apple. We did our part. We just saw Denzel Washington in “A Raisin in the Sun” and it was great! 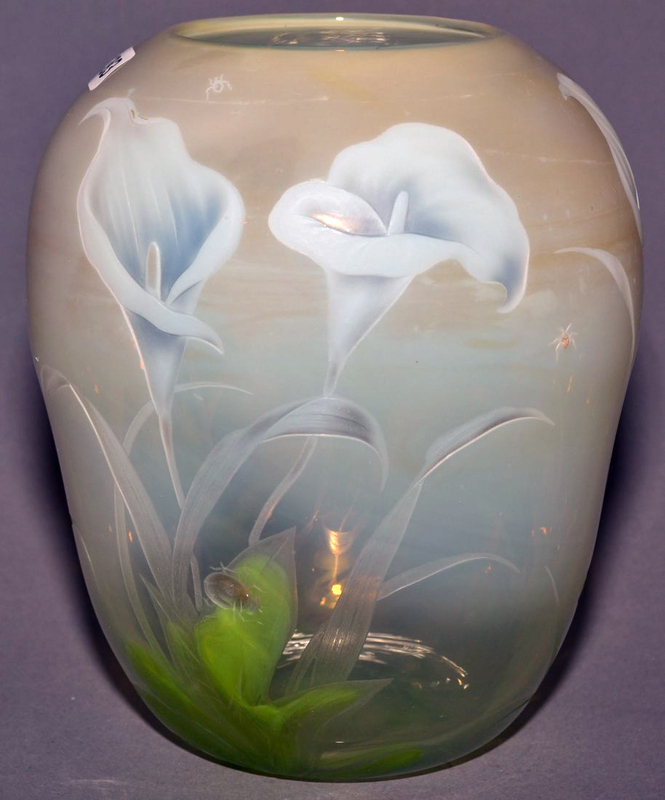 This Thursday’s blog will be about the great results of the art glass sale at Woody’s Auction this past week and next Monday’s post will report the results of the show. Click here to view my site and look around. There are many items for sale, sold items with prices and free lessons about glass and lamps. 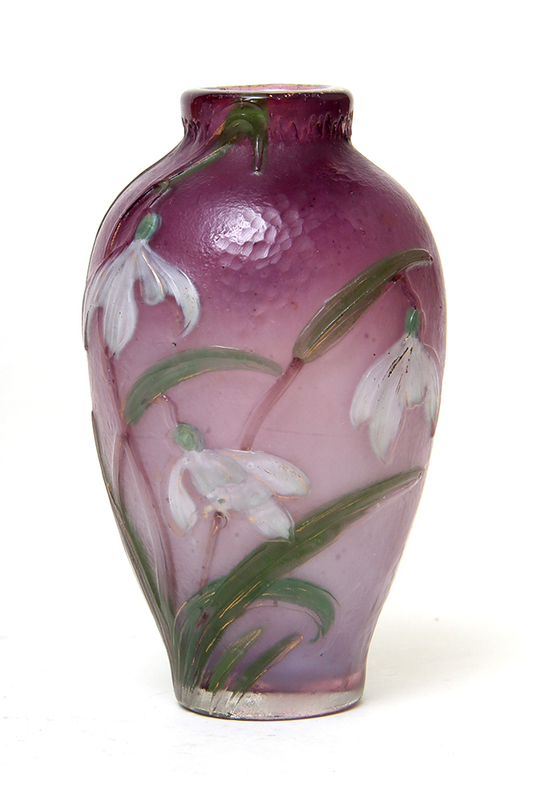 I regularly add new items including Tiffany vases and lamps, and French cameo glass by Galle, Daum Nancy, Argy-Rousseau and A. Walter. I always strive to offer the finest objects for sale on my website and at every show. How sad! The Louvre des Antiquaires in Paris is closing soon. An era is passing. 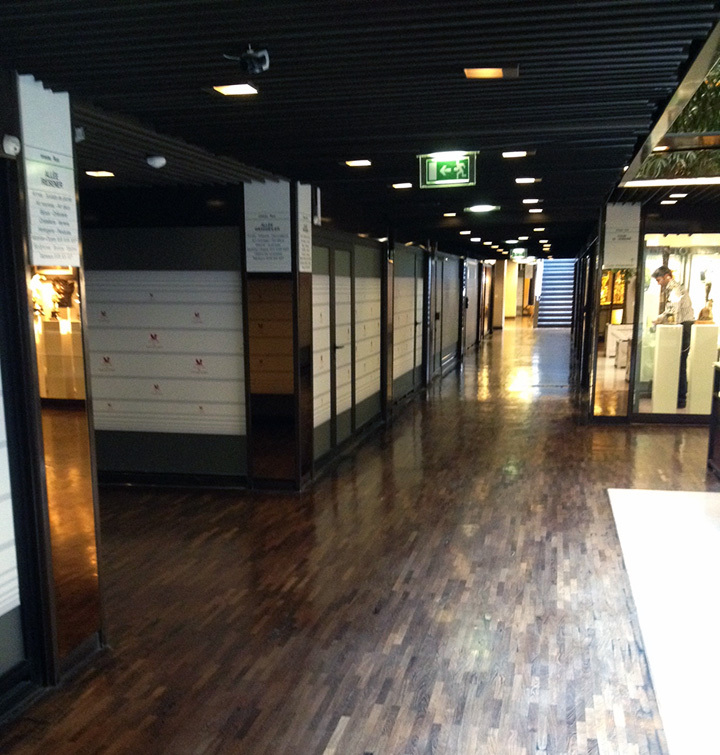 The Louvre des Antiquaires in Paris will close sometime this May or June. The handwriting has been on the wall for some time now. Each time we visited, more and more shops were closed. I asked what was going to happen. There was still some hope the center could be saved. One room was filled with a model of the future Louvre des Antiquaires, which was to fill a smaller section of the front of the building. As time passed, the potential faded and now the sad result is confirmed. For those of you who remember, the Louvre des Antiquaires was so successful at one point in its history, new prospective tenants had to pay significant key money ($100,000 – $250,000) to secure a shop. Key money is essentially a bribe (or more diplomatically an incentive) to the present tenant to relinquish the balance of his or her lease to the new tenant. This had nothing to do with the rent, which still had to be paid to the landlord. The concept was so successful that a similar center was opened in New York City on 57th St. It was called Place des Antiquaires, in homage to its French cousin. Unfortunately it wasn’t as successful and closed in 1992, after being open for only a few years. It was replaced by the discount store Daffy’s. 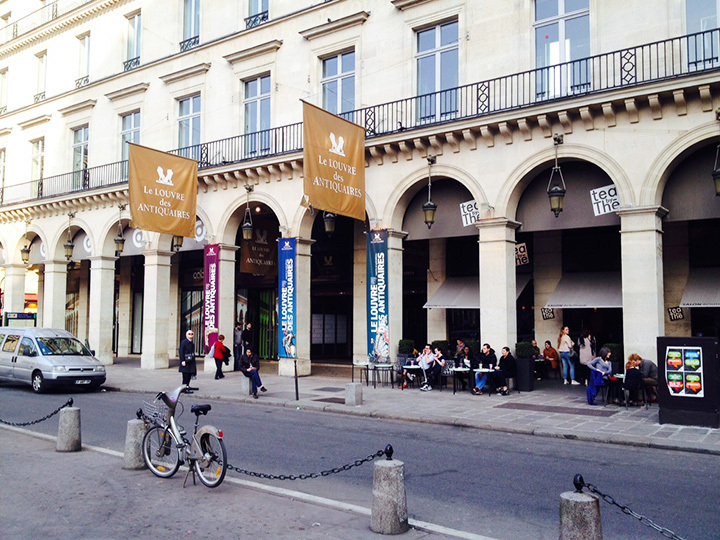 The few remaining dealers in the Louvre des Antiquaires will have to secure independent shops around Paris if they wish to continue in business. I wish them good luck. The NYC Pier Antique Show is coming very soon, March 29-30, 2014. It’s always fun and exciting, so make your plans to come to the Big Apple. In the meantime, we’re on a European buying trip and have found a few treasures to offer for sale. You’ll be able to see them at the Pier show. 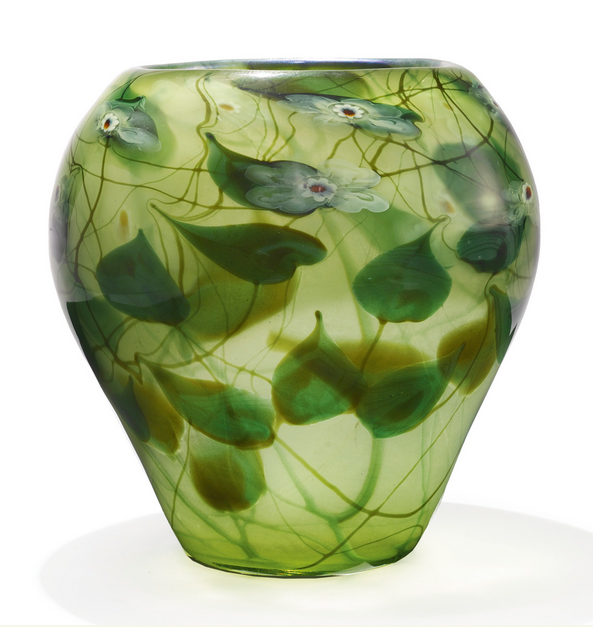 Sotheby’s held its 20th Century Design sale on March 6, 2014 with total sales of $2,356,940. 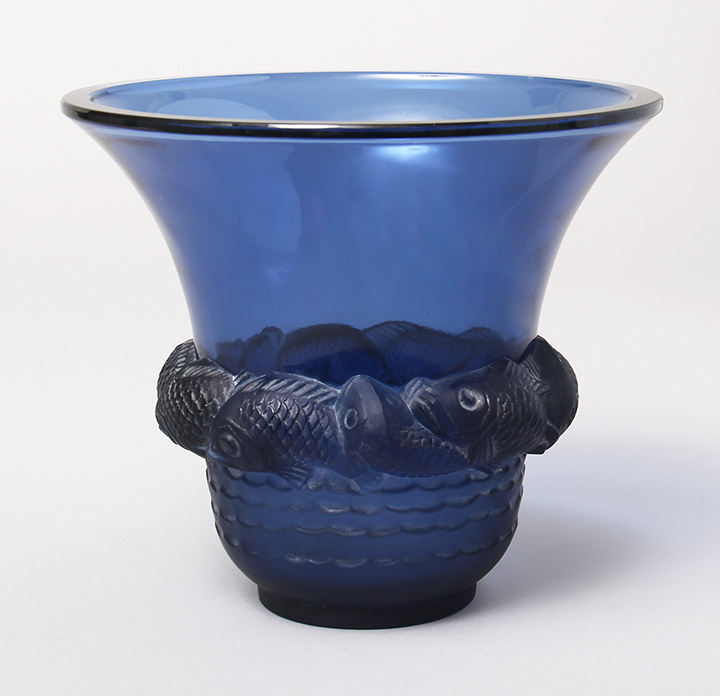 Considering it was an additional, lesser quality sale than the usual extravaganzas of December and June, it had some excellent results, especially for the offerings of Tiffany Studios glass and lamps. 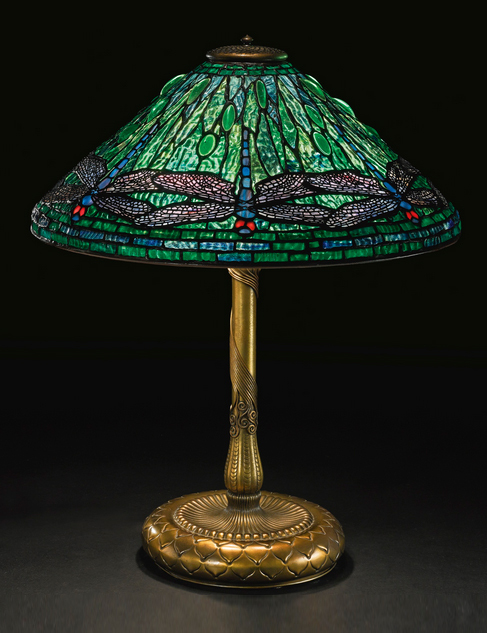 I didn’t care for the top lot of the sale, a Tiffany Studios 20″ diameter Dragonfly table lamp, with a green ripple glass background. The dragonflies didn’t have jeweled eyes and I don’t like the examples with ripple glass backgrounds, but my opinion did not count one iota. It doubled its high estimate of $60,000, to realize $125,000 including buyer’s premium. 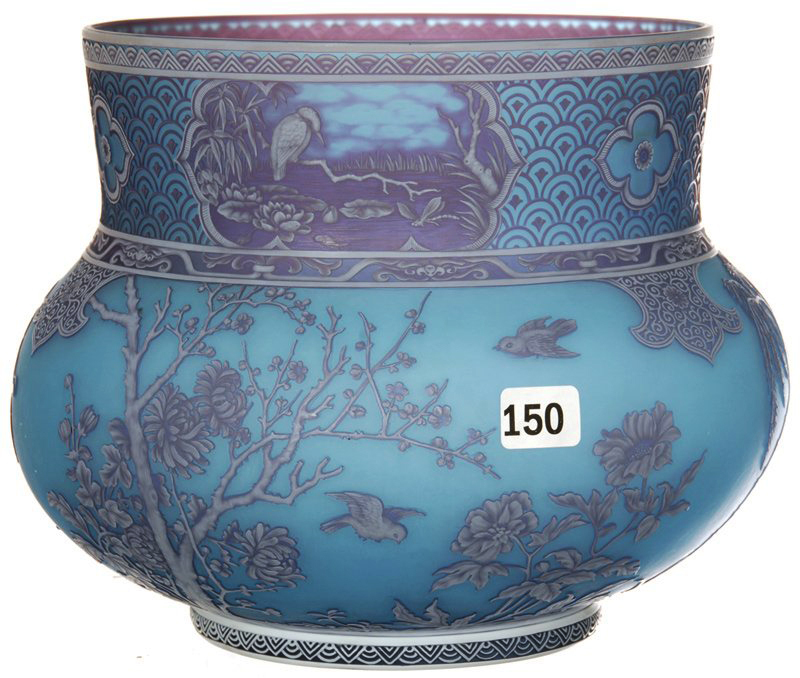 A huge, heavy, Tiffany Favrile paperweight vase, lot #2, sold above its high estimate of $24,000, to realize $32,500 including buyer’s premium. The decoration of millifiori and leaves was quite effective. The biggest surprise for me was lot #8, a collection of 47 Tiffany Favrile tiles, each 3″ x 3″. They quadrupled their high estimate of $8,000, to realize $40,625 including buyer’s premium. 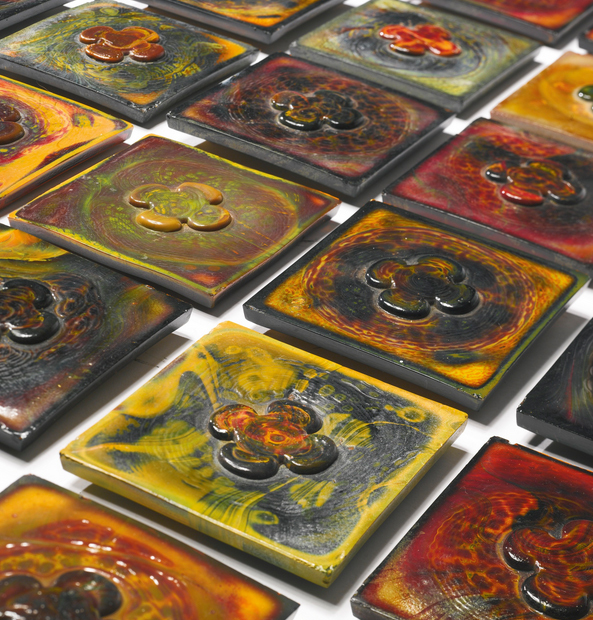 I’ve always had difficulty selling individual tiles, but I guess a large group like this would be perfect for a custom fireplace surround, for example. Whatever the reason, two bidders fought furiously for them. 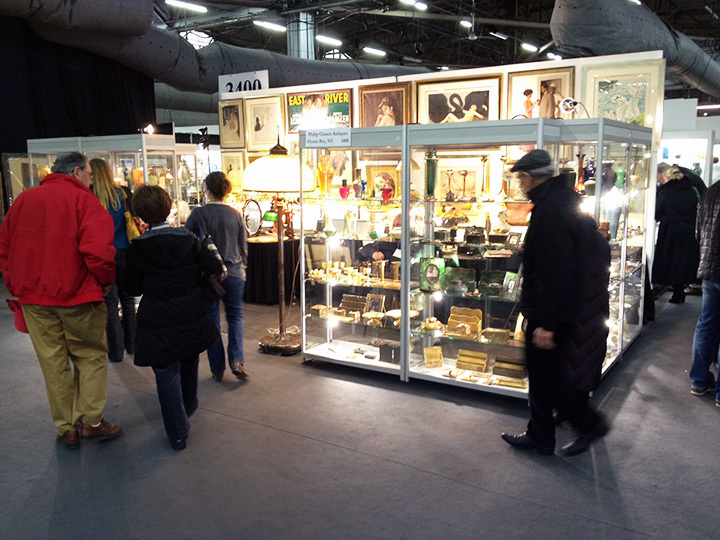 The NYC Pier Antique Show will be held in about two weeks, March 29-30, 2014. It’s always fun and exciting, so make your plans to come to the Big Apple. In the meantime, we’ll be on a European buying trip looking for more treasures to offer for sale. You know we’ll come back with some exciting items, which we’ll exhibit at the show. 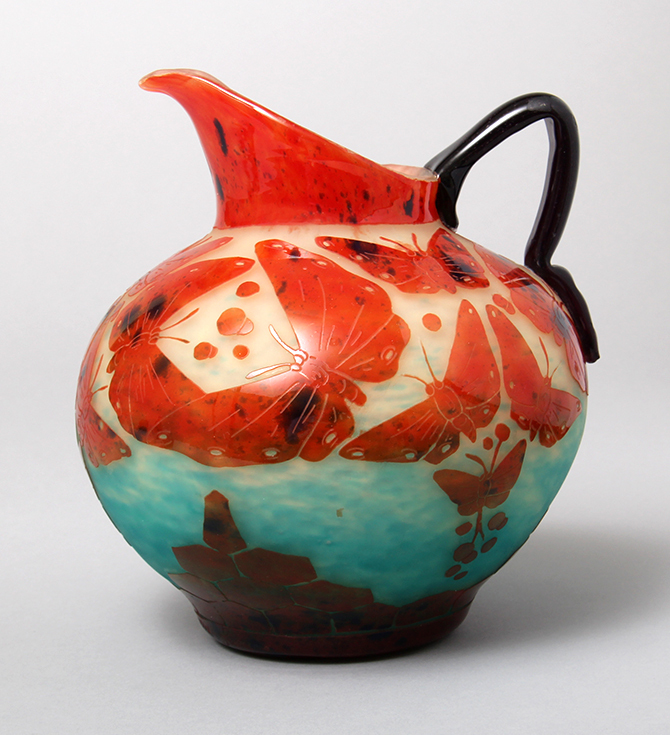 David Rago held two early 20th Century sales yesterday, March 1, 2014, The Lillian C. Hoffman Collection of American and European Ceramics and 20th Century Decorative Arts Auction. The Martin Brothers were well represented in both sales and did not disappoint. Many of the offerings exceeded their high estimates. As expected, lot #18, a rare Martin Brothers triple bird, led the way. It easily trounced its estimate of $30,000 – $40,000, to sell for $112,500, including buyer’s premium. 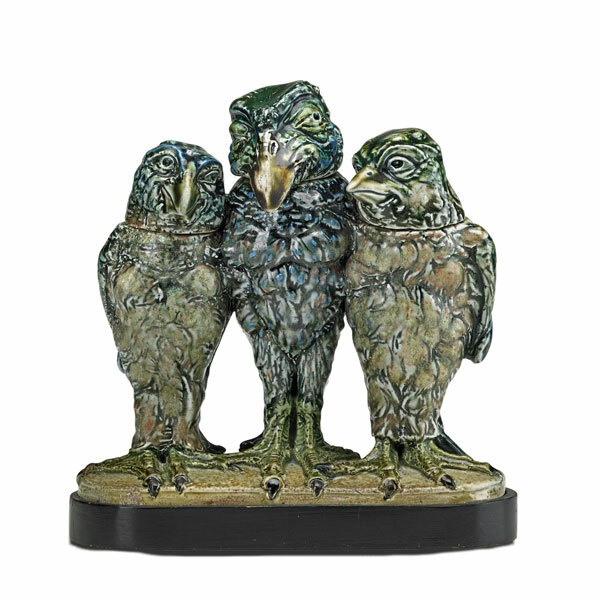 Another triple bird, lot #199, smaller, with no wooden stand, and probably an early re-glaze, sold within its pre-sale estimate, realizing $46,875. 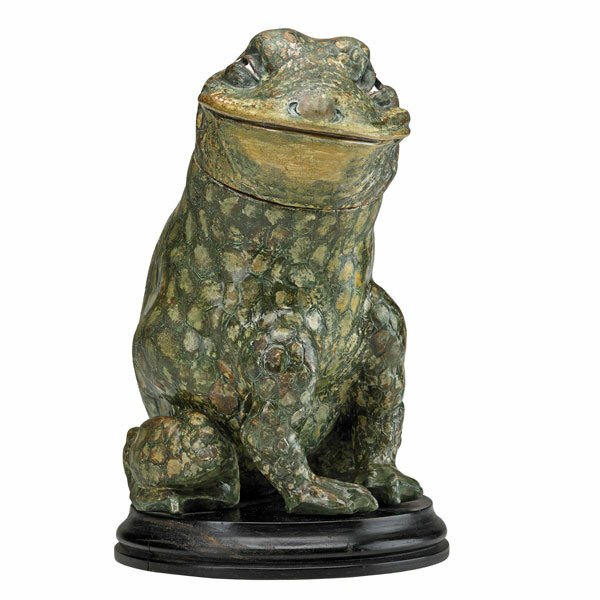 A wonderful Martin Brothers frog jar, lot #17, also did very well. It nearly quadrupled its pre-sale estimate of $15,000 – $20,000, to sell for $87,500. 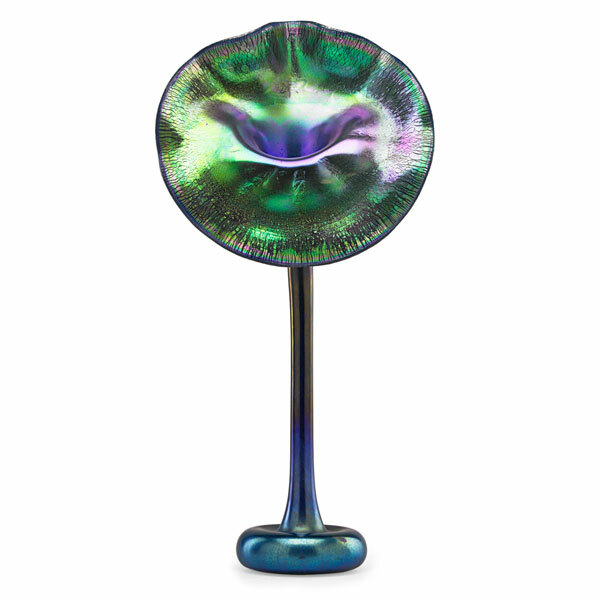 The cover lot of the 20th Century sale, a very rare blue Tiffany Favrile Jack-in-the-Pulpit vase, was the best Tiffany Studios item in the sale. To my surprise, it sold for the low estimate of $50,000 + buyer’s premium, for a total of $62,500. I thought it had a good chance of exceeding its high estimate, but some minor factory flaws may have hurt its result. 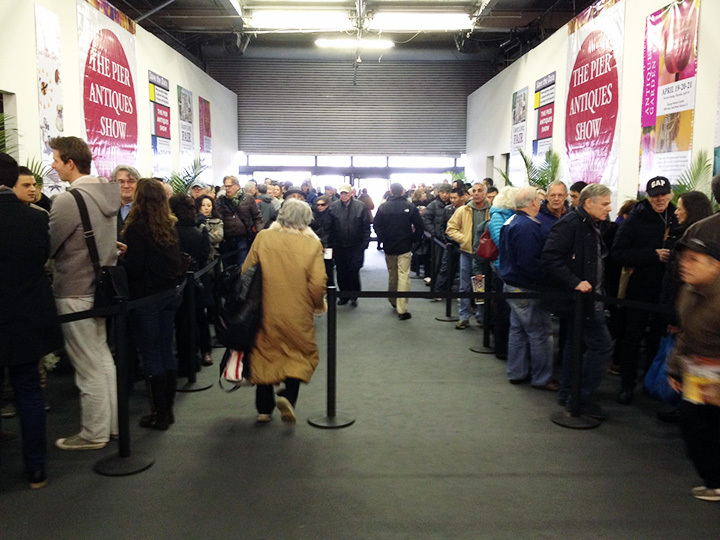 We have about three weeks until our next show, the NYC Pier Antique Show, March 29-30, 2014. That’s always fun and exciting, so make your plans to come to the Big Apple. In the meantime, we’ll be on a European buying trip looking for more treasures to offer for sale. You know we’ll come back with some exciting items, which we’ll exhibit at the show.